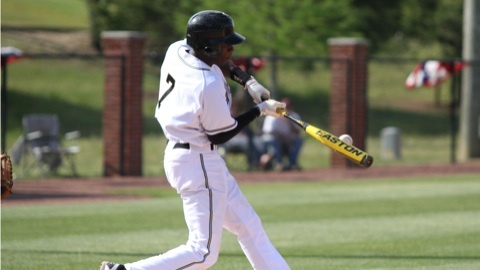 Tim Anderson joins the Intimidators after leading national JuCo players with a .495 average at East Central (Miss.) CC. CHICAGO (June 20, 2013) - Chicago White Sox 2013 first round draft pick Tim Anderson is joining the Kannapolis Intimidators, Class A Affiliate of the White Sox, to open the second half of the South Atlantic League season. The Intimidators are also receiving first baseman Keon Barnum, a 2012 supplemental first round selection (48th overall), and pitcher Kyle McMillen, a 2011 fourth round pick, from Extended Spring as part of 12 roster moves effective today. Chicago made Anderson the 17th overall pick in the June 2013 First-Year Player Draft, selecting the shortstop out of East Central (Miss.) Community College. Anderson, who turns 20 on June 23, will start his professional career with Kannapolis when the Intimidators open the second half of the season on Thursday, June 20, in Augusta to begin a seven-game road trip. He led all junior college players with a .495 batting average and .568 on-base percentage this past season, while finishing second in the nation in slugging percentage (.879) and stolen bases (41) in 53 games for the Diamond Warriors. He led East Central to the 2013 MACJC (Mississippi Association of Community & Junior Colleges) State Championship as a sophomore and was named First-Team NJCAA Division II All-American. Anderson was twice named All-Region 23 and MACJC All-State. He had signed with the University of Alabama at Birmingham prior to being drafted by the White Sox. Barnum, 20, will make his season debut after an injury-shortened 2012 campaign. He entered this season rated by MLB.com as the No. 7 Prospect in the White Sox system and by Baseball America as the No. 8 Prospect in the organization after batting .279 (12-43) with three home runs and eight RBI in 13 games with Advanced Rookie Bristol in his professional debut. A shoulder injury kept him out of action from June 24 - Aug. 3 and from Aug. 13 through the remainder of the season in 2012. Barnum followed an 0-3 performance in his first game with Bristol by belting home runs in three straight games to jumpstart his professional career, going 7-12 with seven RBI in that span. Baseball America rated Barnum as the Best Power Hitter (along with Courtney Hawkins) in the White Sox 2012 draft class. Chicago selected the sandwich pick out of King High School in Tampa, Fla., where Barnum set a team record with a .491 average as a junior and was named to the 2011 Perfect Game Underclass Team. McMillen, 23, will also make his season debut with Kannapolis after missing the entire 2012 season due to an elbow injury. The fourth round pick from the June 2011 First-Year Player Draft made a pair of appearances with Advanced Rookie Great Falls in his professional debut in 2011. The White Sox selected McMillen out of Kent State University where he led the nation and set a Mid-American Conference record with 18 saves in 2011. That season, he made 28 relief appearances, posting a 1.80 ERA while striking out 31 batters in 30 innings of work. The Intimidators also received pitcher David Cales, 25, who was signed by the White Sox earlier in the week. Cales has spent the last six seasons in the Chicago Cubs system, going 13-5 with a 3.27 ERA in 143 games (two starts) and striking out 170 batters in 190 career innings. He is a graduate from Mount Carmel High School in Chicago, Ill. The fifth addition to the Kannapolis roster is catcher/first baseman Brent Tanner, who returns to the club from Class A-Advanced Winston-Salem. Tanner is batting .282 with five home runs and 21 RBI in 36 games this season between Kannapolis and Winston-Salem. In corresponding moves, Kannapolis transferred reliever Todd Kibby and infielder Justin Jirschele to Great Falls. Pitcher Tony Bucciferro and infielders Jake Brown and Patrick Palmeiro were transferred to Bristol. The Intimidators also received Brad Salgado from Extended Spring and placed him on the DL. The Intimidators open the second half of the South Atlantic League season with a seven-game road trip against the Augusta GreenJackets (June 20-23) and Rome Braves (June 24-26). The team returns home for a seven-game home stand beginning Thursday, June 27 against the Greenville Drive. The Intimidators will host a pair of All-American Fireworks nights during the upcoming home stand to celebrate the Independence Holiday. Fireworks on Saturday, June 29, are presented by the Cabarrus County EDC. Wednesday, July 3 features post-game fireworks presented by the City of Kannapolis. The Kannapolis Intimidators are in their 19 season of professional baseball and 13th season as the Class A Affiliate of the Chicago White Sox. The team plays at CMC-NorthEast Stadium, located off I-85 at exit 63. For ticket and promotional information, please call the F&M Bank Box Office at (704) 932-3267 or visit IntimidatorsBaseball.com.